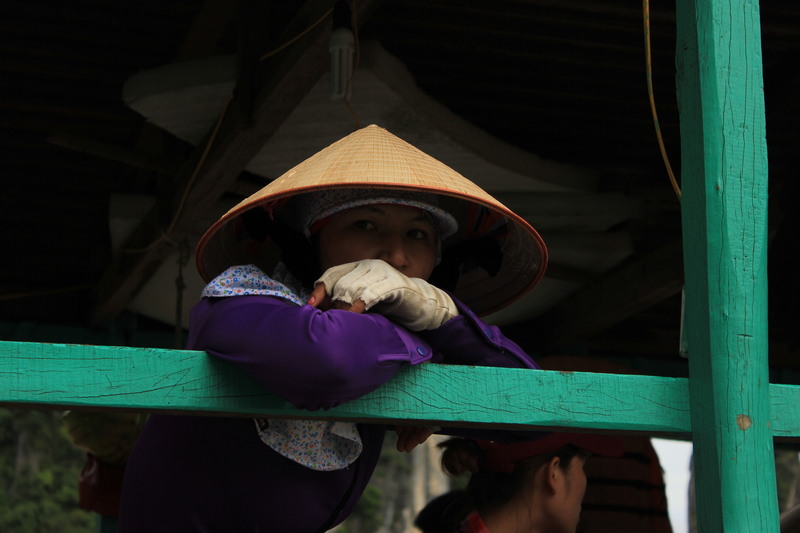 Over the past year, I have gotten the opportunity to travel to Vietnam on several occasions. With each trip, I was fortunate to explore another region of the country. In all of East Asia, it is the country that perplexes me the most. It is full of contradictions that somehow coexist in a precarious package. It is overtly communist with slogans and propaganda bombarding you at every corner; yet McDonald’s, KFC, Gucci and Hermes along with a slew of capitalist symbols operate lucrative businesses. Egalitarianism is preached through policies and sound bites but on closer inspection the dwindling rural way of life and magnetic pull of urban centers are creating large swathes of urban poor who are trying to make ends meet. 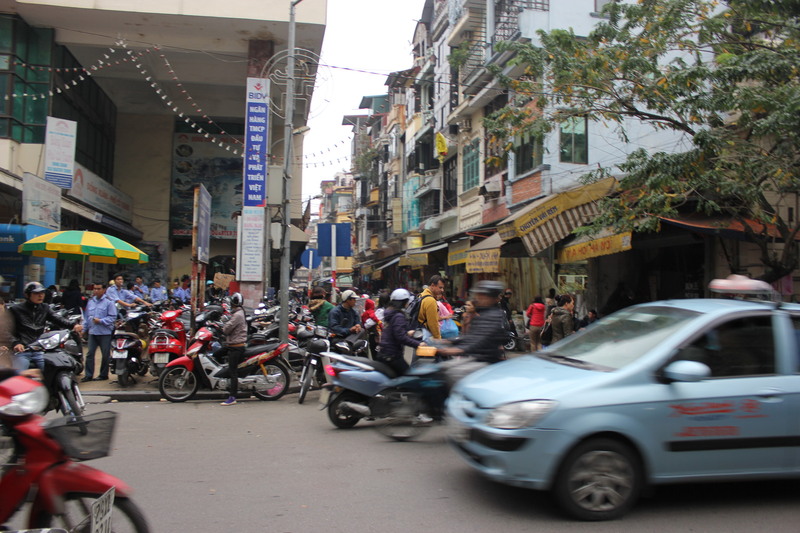 On the surface, Vietnam’s urban centers are teeming with young urbanites. There seems to be an insatiable appetite for luxury goods with boutique stores such as Gucci and Hermes sporting gleaming store fronts. 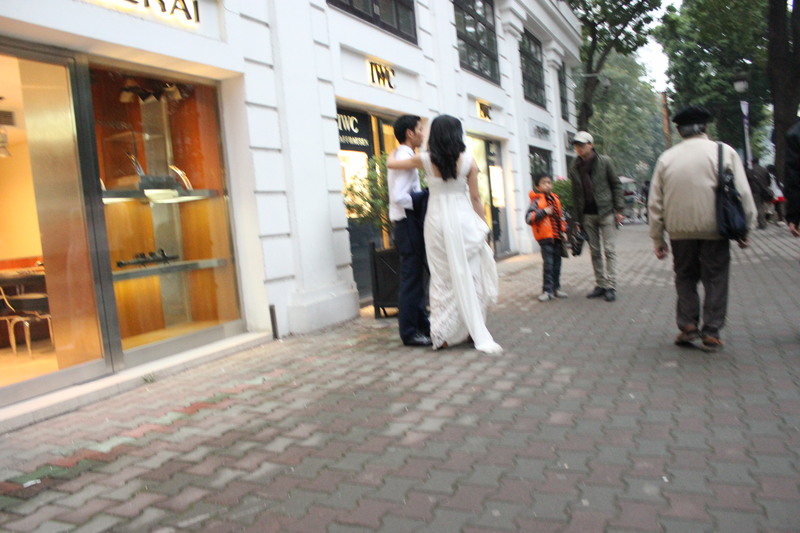 For those who can only afford to window shop, the next best trend seems to be choreographed wedding photos by these store fronts to capture the opulence in their matrimonial snaps. 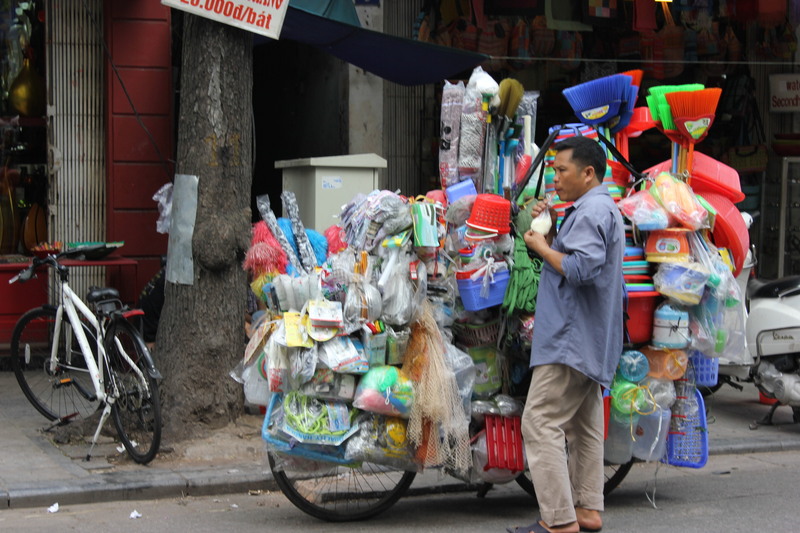 My experience in Vietnam’s urban centers (Hanoi, HCMC or Danang) has been very intimidating. Despite varying pace of life, traffic never stops for anyone, one has to forge his or her way through the sea of motorcycles, bicycles, cars, carts. The simple task of crossing the street becomes a battle to keep your wits, assert your presence (committing to walking in a slow and steady pace so motorcyclists can weave around you) and make it to the other side with minimal scratches. Somehow a parallel for forging a living as an urban dweller in one of the country’s rapidly growing metropolises. Despite the turf rivalries between Hanoites and Saigonese residents, the former known by their southern neighbors as up-tight, frugal and bogged down by customs and traditions; while the Hanoites accuse their southern neighbors of being far too happy-go-lucky, loud and brash. The war of words and divisions extends to food and life style. This neat infographic gives a bit more insight as to the preferences of Hanoites vs Saigonese. All differences aside, from what I saw the majority of residents in Hanoi, Ho Chi Minh City (Saigon) or even Danang all seem to be in the below 30 years old demographics. Bia Hoi’s (local beer vendors) and pop up street food stalls are full of young, 20 something sporting the latest western clothing trends, k-pop inspired hair-dos and armed with the latest electronics. All are bubbly and chatty and the constant hum of chatter, motorcycles, vendors creates the perfect atmosphere for a people-watcher’s paradise. On the flip side of this urban utopia, Vietnam’s rural landscapes are breathtakingly picturesque but mask the harsh reality of rural daily life. I was struck time and time again passing through eye-popping green rice paddy fields and noticing that the arduous, labor intensive task of harvesting the rice was undertaken by elderly women. Time and time again, I saw aging women vastly outnumbering men or young adults tending to farms. This left me thinking if all the young folks are heading to Hanoi, HCMC or Danang and not coming back, who will carry on this work? and where are the next generation of food growers? Another realization is for a county that has sped up to catch up with the pace of its neighboring Asian Tigers, very little has been done to quell this mass exodus from rural settings to the cities. 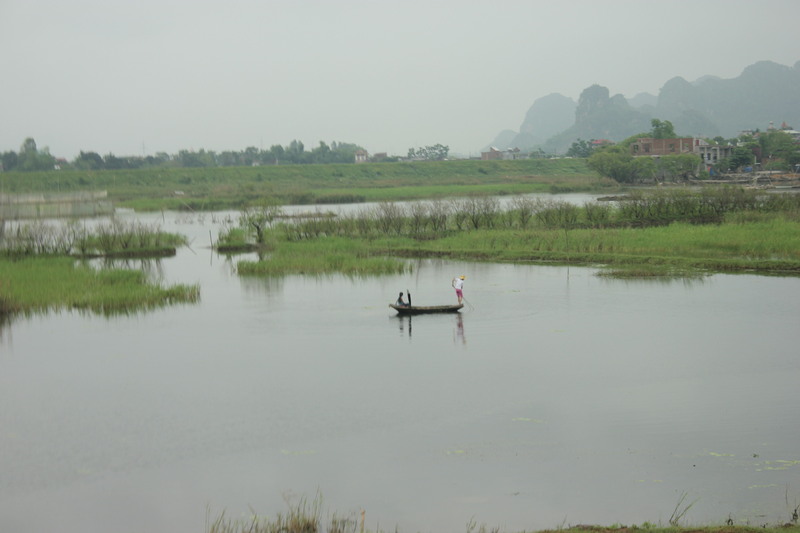 Although Vietnam is one of the world’s largest rice exporters. In international markets, its rice quality is seen as inferior to neighboring producers. As food consumption increases, this stress on water resources is becoming more pronounced, particularly since the staple crop, rice, is still being grown using water intensive mechanisms. This is a country that I would love to spend more time peeling back the layers and unearthing the idiosyncrasies that make this nation tick. It’s a task that takes some time given the tightly packaged and sanitized version painted by socialist ideals yet slowly cracking from the pressures of capitalist temptations. I have been meaning to write about my trip to Northeastern Sudan for some time now but as usual many excuses can be inserted in this *________* space. I have been neglecting this blog for some time now but I’m hoping to be more active. Part of the delay with writing this post is also my apprehension that I find myself writing about my country in a sensationalized manner. In which, fellow countrymen are represented as anthropological case studies to be examined. So in writing this I’ve tried to be cautious of that and record my observations to the best of my abilities, without portraying the people/communities that I have encountered as an exhibit. Every time I venture into a new part of Sudan, I am taken aback by the vastness and diversity of this country. It is also sobering to see life outside of the bubble that is Khartoum. This time curiosity took me towards Atbara River. Starting through the very familiar road from Khartoum to the town of Atbara, the sight of blown up tires littered the sides of the narrow road- a reminder that how this desert environment can be so harsh and unforgiving. After reaching Atbara, we left the familiar tarmac road and ventured off on dirt tracks. Passing droves of ghost towns- towns built to compensate Manasir people for their displacement from Merowe. These houses and dry irrigation canals stood as a haunting reminder of the government’s blatant failure to provide any sort of adequate consultation or come up with some sort of acceptable solution that could have been far less costly than this current wasteland…Such a shame. We drove in parallel with the Atbara River, which extends through River Nile and Kassala states and beyond the border over to Ethiopia/Eriteria. Across the border it’s referred to as the Tekeze River. The road or lack there off consisted of tracks laid by the occasional lorry or pickup truck before us. Driving across endless dunes, batched up with the occasional protrusion of Acacia trees, I realized that the horizon is much closer that I had initially thought. It seemed as our car could potentially fall off the face of the earth beyond the coming sand dune. Despite the serenity of the landscape, I found myself thinking how anyone could survive in such callous environment. Most citizens in this area are nomadic peoples, tending to their livestock along historic predestinated routes. For centuries they have managed to forge a living through lucrative camel trading in relative peace. To take advantage of the cooler weather, our trips usually started at 5-6 am before sun break. In the early mornings we had the pleasure of witnessing impromptu camel races. Young boys, probably no older than 10 years old, mounted on the backs of sturdy camels, galloping across the flat landscape with ferocious clouds of smoke trailing behind them. These boys are training these camels for their debuts in races that take place in Kassala State. From there the best of the best are sold at rates of US$10k and upwards for pure breeds. These camels are taken to the Arabian Peninsula, mostly UAE for bigger races and camel breeders. Not long ago, many of these young boys would also be sold with the camels as their small body frames make for excellent Jockeys. Their blight came to light when several sources began highlighting their abuses; mostly undocumented in these Gulf States are they abused and then discarded like objects once they have outgrown their desired size/weight. These days this solitude has been abruptly disturbed by the discovery of large deposits of gold in these deserts. As a result there has been a modern day gold rush to these desolate dunes. At the occasional haphazard rest stop/fueling station (usually consisting of several large jerry cans of petrol), I was surprised to find young boys/men not exceeding the age of 30 from all across Sudan. These men have left their respective corners of the country and made their way to this desert with the prospects of finding small nuggets of gold through arduous process of breaking up sandy/rock formations and sifting through under the intensely painful sun. In talking with some of them, it was interesting to see the mix of tribes, and socio-economic backgrounds represented. It ranged from those who have lost most of their livestock, to those whose families could not support the high cost of subsistence agriculture to university educated men, who have lost hope on the prospects of finding employment. In all, their stories were tied with the same somber tone of desperation. 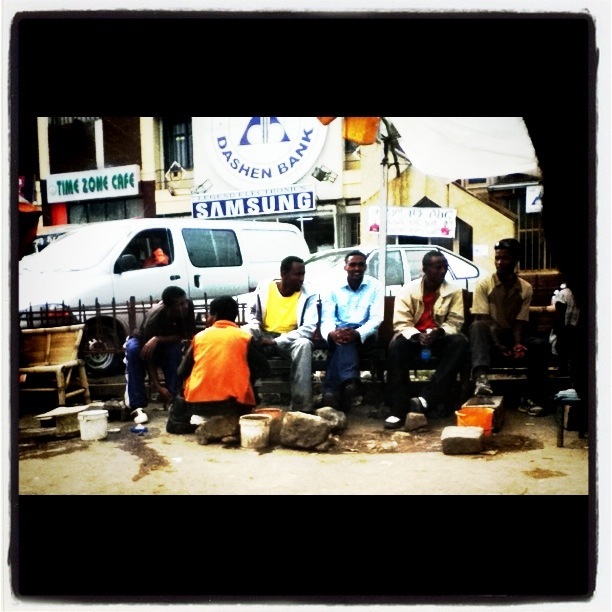 It was eye-opening to see the extents that these young men will go in order to earn an income. After several days of spending time in these regions of the country, it is evident that these communities have been completely forgotten by the central government and they in turn have little faith in such an institution for providing them any semblance of basic services. They definitely feel the impacts of climate change/climate variability. Clans that once boasted herds in the 10s of thousands are now lucky to retain a handful for basic subsistence. The irony of the situation was palpable. Sudan as a nation is one of the largest exporter of livestock on the continent, yet those who labor in rearing these herds reap little benefits. We marked the end of our several day trip, exhausted and covered in a healthy layer of dust/sand. As we approached the outskirts of Khartoum, the distinct flames of the Al Gaili Oil Refinery blew in the distance- with it came lights and more densely populated communities. Entering the city of Khartoum, I was left in a daze trying to reconcile the environment that had been introduced to over the course of the previous days and the car-infested streets of Khartoum. With drivers, lacking patience went about trying to burrow themselves into tiny holes within the traffic gridlock. Recounting the pleasant conversations had over freshly brewed jabana (coffee) and contrasting it with the impatient horns of Khartoumites was difficult to grasp that these communities existed on the same continent. Appreciative of the diversity that makes up this country. I wish it was a bit more celebrated rather than being used as divisive tool to serve political agendas. Who makes the rules? Who changes the equation? How could you get out of line? I asked you the matter?